Dr. Bruce teaches primarily General Chemistry and Physical Chemistry. 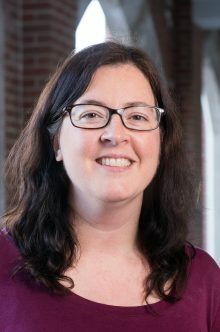 She has published in the Journal of Chemical Education and is currently the Chair of the American Chemical Society Exams Institute Physical Chemistry Exam Committee. The Bruce lab studies how molecules interact with each other when they are not chemically bonded. These non-bonding interactions are important in applications as varied as drug interactions and cell phone batteries. Current students are studying how shape and charge of small molecules impact their interactions with proteins and DNA using computational chemistry techniques to develop models to explain these phenomena. Dr. Bruce is a member of the Molecular Education and Research Consortium in Undergraduate computational chemistRY (MERCURY) Consortium. Students in the group may have the opportunity to present their work at local, regional, and national meetings as well as being co-authors on peer-reviewed journal articles. “Factors affecting the number and type of student research products for chemistry and physics students at primarily undergraduate institutions: a case study” Birgit Mellis, Patricia Soto, Chrystal D. Bruce, Graciela Lacueva, Anne M. Wilson, Rasitha Jayasekare. PLOS One. 2018. “Molecular dynamics simulations of apo and holo forms of fatty acid binding protein 5 and cellular retinoic acid binding protein II reveal highly mobile protein, retinoic acid ligand, and water molecules” Nathanael H. Hunter*, Blair C. Bakula*, Chrystal D. Bruce. Journal of Biomolecular Structure and Dynamics, 2017, online. “AxaHx, A Novel Fluorescent, DNA Minor Groove and G. C. Recognition Element: Synthesis and DNA Binding Properties of a p-anisyl-4-aza-benzimidazole-pyrrole-imidazole (azaHx-PI) polyamide.” Satam, Vijay, Balaji Babu, Pravin Patil, Kimberly A. Brien, Kevin Olson, Mia Savagian, Megan Lee, Andrew Mepham, Laura Beth Jobe*, John P. Bingham, Luke Pett, Shuo Wang, Maddi Ferrara*, Chrystal D. Bruce, W. David Wilson, Moses Lee, John A. Hartley, and Konstantinos Kiakos. Bioorganic & Medicinal Chemistry Letters, 2015, 3681-85. “Dynamic hydrogen bonding and DNA flexibility in minor groove binders: molecular dynamics simulation of the polyamide f-ImPyIm bound to the Mlu1 (MCB) sequence 5′-ACGCGT-3′ in 2:1 motif” Chrystal D. Bruce, Maddi M. Ferrara*, Julie L. Manka*, Zachary S. Davis*, and Janna Register*. J Mol Recog., 2015,28, 325-337.